Dr. D. Allen of Old Dominion spoke at SITE about Student Developed WikiTextbook for a college course. Basically each student writes a 1,000 word article with five multiple choice questions at the application level and with five sources. The topics are arranged so that three students write about the same topic. Students rate each other’s articles according to three criteria and those with the highest votes are included in the course wikibook. Half of the students’ grades are based on reading the wikibook articles and taking quizzes made up of the students’ questions. In the second semester, they read the best articles from the previous semester and rewrite weak ones. He raises the question of what is credibility in terms of sources (students did 2 academic sources, 2 popular ones and one of their choice). Also, he raises the issue of student empowerment in a course. Since students have to synthesize the information that is available and since they know the information is for a wider audience (the class), they probably tend to write with a greater focus on applying the information. The idea of a constantly improving Wikibook for a course intrigues me. I would make some suggestions to his process. Each semester I would like students to improve on the previous semester’s articles. I would have the students evaluate student produced articles against formal text books about the same topics. I would like outside experts such as other professors to evaluate the student’s chapters to insure a high level. Imagine students being mentored by an “outside” expert as they write the chapter. 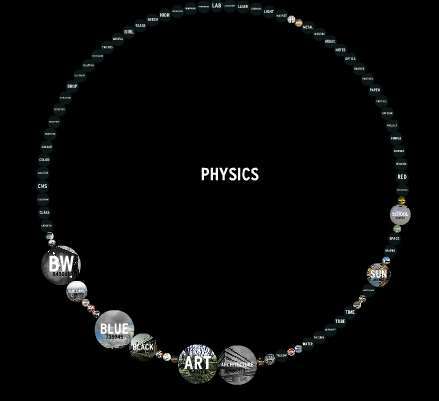 Could you apply a similar process in your course so that your student create a meaningful textbook (wikibook)? By your creating a structure for this process, students become more engaged in the material, work in a collegial manner, are held to a high standard of learning, and focus on the specific standard areas that you have determined are important. In addition, they like to see their high quality work “published” on the web. If you have created a class wikibook, please share information about it. Paul Resta spoke on the Digital Divide. The Digital Divide is much more than just access to computer and the Internet. He prefers that instead of the Digital Divide, we think of Digital Inclusion. There is exclusion based on social, economic, geographical, language, and gender. He demonstrated through a graph that 70% of the web is in English, 5% in Japanese, 5% in German and 3.9 in Chinese: the English language excludes many people from accessing the information. He stresses that there is a Knowledge Divide and that even if the Digital Divide is closed, the Knowledge Divide will not be solved. There is a shortage of teachers worldwide. He showed various world maps showing the percent of the continent not having radios, tvs, and computers. He stated that the USA is number 16th in the world in terms of penetration of broadband. Educators who are culturally responsive. How much do you students work with students in other nations through technology? What do you do in your classroom to help students understand the daily culture of another country through technology? His vehemently argues that in natural learning we set a goal, we fail, we try again, and we develop a strategy for how to improve. He gives these examples of goals set and achieved by people: a young child learning to say”cookie”; a person learning to skateboard; and a person learning to play the guitar. In this theory, failure and recovery model, we want students to fail regularly, often, and early so that they can develop in their learning goals. A good teacher does not lecture. A good teacher does not answer questions; he/she forces the students to answer their own questions. A good teacher does not give grades. A good teacher does not determine the curriculum; an expert in the subject area (a scientist) does that. A good teacher does not have in-depth knowledge about the subject area; he/she facilitates learning in the subject area. Do you see students’ mistakes and errors as opportunities for learning? Does your classroom demonstrate natural learning? How do you use technology to facilitate natural learning? What other examples have you used to improve students’ standards math learning through technology? 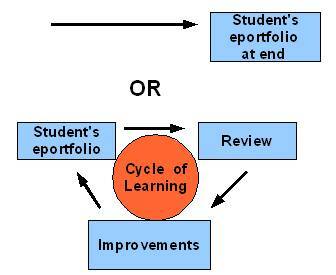 Eportfolio as Formative: Do We Help Students Improve? As I have been looking at some students’ eportfolios, I have been hit by a driving concern. If we find that over 50% of the students are deficient in a certain skill such as the ability to identify an area for improvement, how do we build the remediation into our course? If we notice this deficiency early in the year, we could rectify it by spending class time on it. If we only notice this deficiency at the last summative eportfolio, then, at best, we can pass on the information to their next year’s teachers. How do we build in frequent eportfolio checks and how do we thoroughly examine the eportfolios each time so that we can catch such deficiencies early in the semester or year and therefore build in time and activities to help the students improve? How do we do a class wide analysis of our eportfolio examinations to see what patterns are emerging? If the students’ demonstrations of the standards/proficiencies through an eportfolio are important to us, then we will build class time in for student improvement. If we only do a superficial check in on the eportfolio during the semester and if we only evaluate an eportfolio at the end of the semester, then the eportfolio is more of a “buzz word” or busy work than a meaningful formative educational tool. So how do you use eportfolios? There are several Flickr programs that allow you and your students to find tags associated or clustered with the initial tag you searched for. This can be a great educational game for your students. You think of a tag like ice for your science unit and then you ask the students to list all the related tags (categories) that they can think of. Then type “ice” into one of the above and compare the tags to the students. Have the students determine which are science categories and which are non-scientific categories. This type of inference thinking helps to broaden the students’ thinking and helps them to think in terms of connections instead of one isolated term. They have to compare and contrast tags. So how do you have you students develop tag (category) building through Flickr? What does it mean if a pre-service teacher directly copies his/her reflection from a previous semester in his/her most recent eportfolio and does not add anything? The previous semester’s reflection was the best that it could be and it cannot be better this semester? The student ran out of time to think about the proficiency so he/she just copied it? 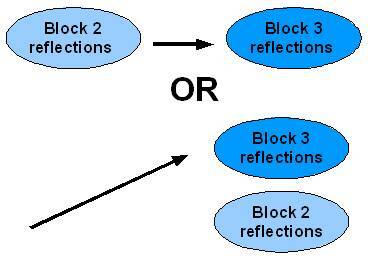 If it is the second, then how do we build time in the semester for the students to reflect on their growth? If it is the first, then our program needs to be examined so that each semester provides deeper and richer experiences for the students. What do you do in your program so that students have more in-depth and more comprehensive proficiency reflections each semester?